Ukrainian interim Prime Minister Arseniy Yatsenyuk has warned Russia than any attempt to annex areas of Eastern Ukraine will meet a very tough response, including a military one. EU in Brussels also spoke of measures beyond the already agreed, should Russia move into Ukrainian mainland. But does Russia have an appetite for East Ukrainian provinces and how likely is the escalation of this political crisis to a military one? Addressing the Russian parliament on the reunification with Crimea President Putin emphasized that Russia does not want the collapse of Ukraine. “I want you to listen well, dear friends”, he said, sending this message to the Ukrainians. But Ukraine is divided, if not physically, with a lot of ethnic Russians and Russian-speakers in East Ukraine not being very happy with strong nationalist and anti-Russian overtones in Kiev and the West of the country. The regions of Kharkov, Lugansk and Donetsk used to be Russian provinces until they were annexed to historic Ukraine by the Bolsheviks back in 1918 for political and ideological reasons. This is not to say that there is an overwhelming desire to reunite with Russia. In the 1991 referendum, the majority of East Ukrainians voted for independence from the Soviet Union, unlike the people of Crimea where the vote went the opposite way. Since then there were ebbs and flows in the relationship between East Ukraine and the successive governments in Kiev who inconsistently pursued the policy of Ukrainisation of the region, sometimes halfheartedly, sometimes fairly vigorously. Overall, there emerged a modus vivendi whereby the industrial East was allowed a degree of autonomy and closer ties with Russia that brought jobs and money to fill Kiev’s coffers. Russian language was eventually recognised as official in the region alongside the Ukrainian. The violent change of guard in Kiev in February has breached the status quo. 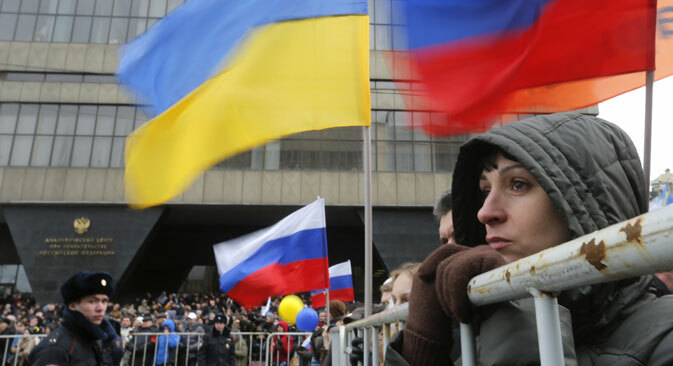 An immediate attempt to repeal the language law and the replacement of homegrown governors and mayors with pro-Western appointees from Kiev have led to unrest, which while being played down by Kiev is seen as a cause for major concern in Moscow. President Putin voiced this concern in his address to both houses of the Russian parliament. “Millions of Russian people, Russian-speaking citizens live and will continue to live in Ukraine, and Russia will always defend their interests by political, diplomatic, and legal means. However, primarily Ukraine itself, should be interested that the rights and interests of these people are secured – this is the guarantee of stability of the Ukrainian statehood and the territorial integrity of the country,” Putin said. Earlier he had secured the permission of the parliament to use the Russian military to protect Russians and Russian speakers in Ukraine. But will he avail himself of this permission? That depends mostly on Ukraine, and partly on the international community, believes Ruslan Pukhov, Director of a Moscow Centre for analysis of strategies and technologies, AST. “Ukraine is basically a failed state and if the ultra-nationalists consolidate their grip on power, and blood is spilled in East Ukraine as a result, Russia would not be able to stay away. She would be damned for whatever she does, so she may as well do what she thinks is right”, says Mr. Pukhov. From a purely military point of view there appears to be no real obstacle to the Russian forces crossing into mainland Ukraine. Its acting Minister of Defence Ihor Tenyukh admitted that the Ukrainian army is in a very poor state. This was demonstrated by the swift takeover of all Ukrainian military bases in Crimea by the pro-Russian forces. Admiral Tenyukh said Ukrainain army could not retaliate because there was no formal declaration of war from Russia and any military action by the Ukrainian side would place the blame for the start of hostilities squarely on Kiev. Moreover, the Ukrainian officer corps is suffering from split allegiances. Chief of Ukraine’s General Staff Admiral Yuriy Iliyn, suspended by the new government in Kiev but still a voice of authority to many Ukrainian officers, has called on them to keep calm and composure and refrain from opening fire on their Russian brothers as he put it. However, moving into East Ukraine will present all sorts of logistical and security challenges, believes George Friedman, Chairman of Startfor, a leading consultancy in the field of global intelligence. “First, Ukraine is a large area to seize and pacify. Russia does not need an insurgency on its border, and it cannot guarantee that it wouldn't get one, especially since a significant portion of the population in western Ukraine is pro-West. Second, in order for an invasion of Ukraine to be geopolitically significant, all of Ukraine east of the Dnieper River must be taken. Otherwise, the frontier with Russia remains open, and there would be no anchor to the Russian position”, opines Mr. Friedman. The porousness of the thousand mile long Ukrainian-Russian border will make it extremely difficult to contain infiltration by Ukrainian nationalist militants, says Ruslan Pukhov of AST. He believes, East Ukraine would be a huge liability to Russia, not just in military but in economic terms as well. He points that Crimea will need a lot of material help from Moscow after 23 years of neglect, and the cost of it will dampen any appetite, if there is any, for East Ukraine. However, Mr. Pukhov repeats, “if the Russian population in Ukraine is mistreated Russia would have no choice but to intervene, the way it did in Crimea”. He is certain there had been no plans to seize Crimea, and what happened there was a complete improvisation in response to the threat from the nationalist government in Kiev. If it was an improvisation, it was a well-prepared one, believes a former FSB (Federal Security Service) General Yevgeniy Lobachev. The way events in Crimea unfolded, he told Pravda.ru news resource, proves that Russia was closely monitoring the situation and stepped in at the most opportune moment. If the newly formed Ukrainian National Guard, comprised of radical nationalists, starts mischief, as General Lobachev put it, Russia will have legal grounds to intervene to protect civilians in other parts of Ukraine.